The ability to hashtag content was made available by Facebook in June of this year. The thought process was to conform to what most people would say is the most powerful tool on twitter (when used right). This would help Facebook distance itself even further as the biggest social platform in the world. Something, however, just isn’t going the way Facebook intended with the integrated hashtag system. Recent studies have concluded that hashtags in Facebook posts not only make your content less likely to go viral, but it will also decrease the engagement on your content. Why hasn’t Facebook cracked the code on hashtags? What makes it such a powerful tool on one social platform and such a useless tool on another? I believe a lot of the problem could be due to the idea that people have already engraved in their mind about hashtags and where they belong. Before June someone who used hashtags on Facebook was either unaware of how Facebook works or they were copy pasting their tweets to Facebook. Either way this shed a bad light on ones Facebook presence. 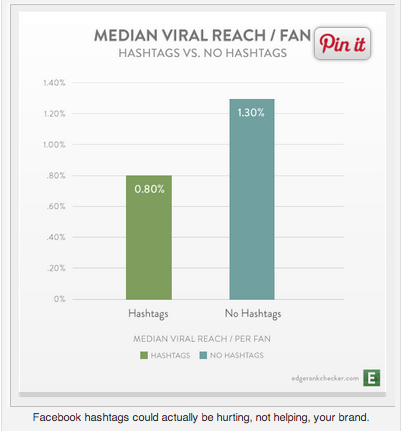 I think many people continue to view people who use hashtags on Facebook in the same light. I do believe as time goes by people will eventually forget all of that and integrate hashtags to Facebook because it is such an amazing tool that connects you with everyone talking about the same thing you are. Why has it not been welcomed with open arms during its June launch? Will hashtags ever become an effective tool on Facebook? What do you think? Co-Owner of @SomeMarketingCo. Tweet at me any questions, comments, or feedback. I would love to chat! I REALLY like the idea of using Hashtags on Facebook. It would be great to search on #adoptablerescuedogs and find every single dog in every shelter and every rescue organization in one place. How about a hashtag for your favorite team….see what EVERYBODY is saying about your favorite sports team. It’s great. Hashtags really are an amazing tool. The ability to find everyone who shares your passion, like dog rescue, with one click can be used in so many beneficial ways. Hopefully hashtags find their place on Facebook sooner rather than later. Thanks for your comment.